Rugby is not new to the archipelago. The 2019 World Cup will open a new chapter. 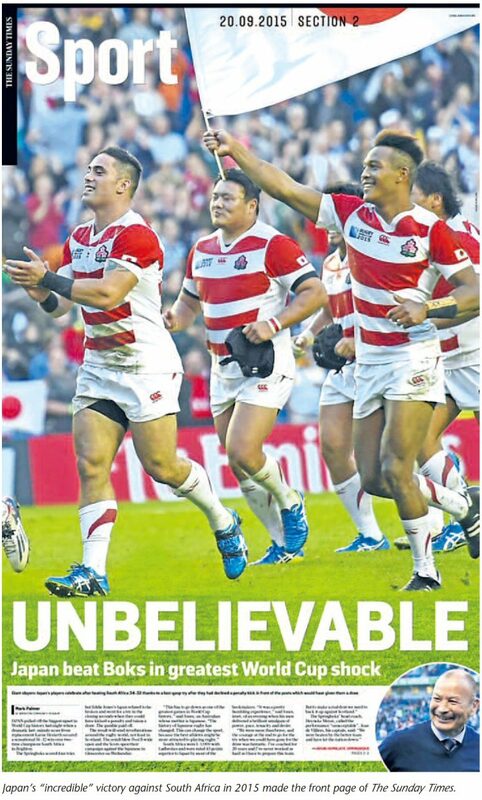 In less than a year’s time, Japan will host the Rugby World Cup for the first time in its history. The event is of paramount importance for the authorities as it will be a kind of dry run for the Tokyo Olympic Games taking place the following year. The weather should be ideal for the rugby players coming from all corners of the world, as well as for the fans of the game that’s played with an oval ball, in complete contrast to the Olympics, which will take place at the height of summer in suffocating heat quite unsuited to any sporting activity. After this year’s heatwave, when temperatures often reached 40°C, many people voiced their concern about the choice to hold the Olympic Games in summer, recalling that in 1964 they were held in October, about the same time of year as the upcoming Rugby World Cup. Hosting this competition in the archipelago marks a turning point for the game as, despite being introduced to Japan over 150 years ago, rugby was not played by locals on a regular basis until later. 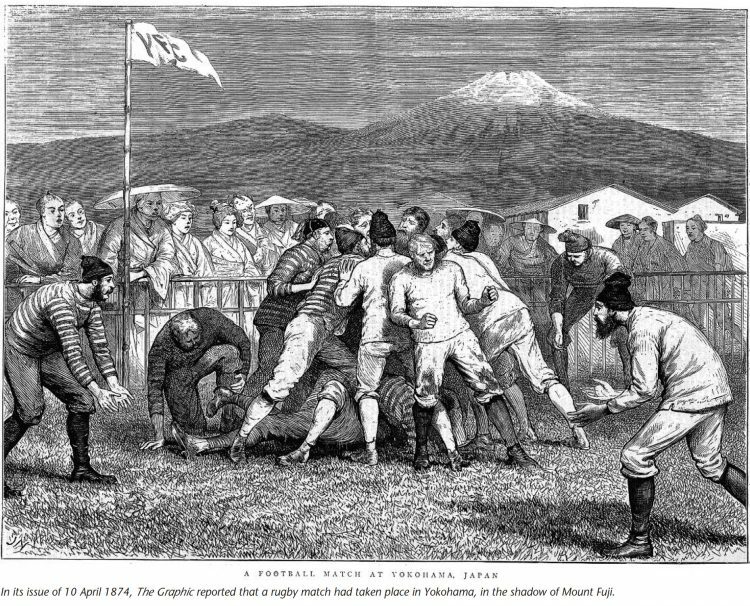 According to an illustration that appeared on 10 April 1874 in the weekly English newspaper The Graphic, rugby matches were taking place in Yokohama, located south of Tokyo. This port city had become the main location where Japanese people were able to discover all kinds of novelties introduced from abroad. This was where Commodore Perry came to enforce the opening of Japan’s ports to trade with the West and demonstrated the first model train to crowds of astounded people. Out of all the gifts brought by the Americans, this was the one that “made the greatest impression on the Japanese”, one of his entourage noted in his journal. “Dozens of Japanese surrounded the track and were unable stop watching the train circling around. They couldn’t contain their joy every time they heard the engine whistle”. Looking at the image published in the British magazine, one can see how interested the Japanese people in their traditional costumes appear to be watching the match played by members of the Yokohama Foot Ball Club, which had been established in the city since at least 1866, according to some records. An editorial that appeared on that date in the Japan Times states: “More than forty names have been put down as willing to support a Foot Ball Club, and as we happen to have two or three Rugby and Winchester men in the Community, we may be certain that we shall have really good scientific play”. The reference to the towns of Rugby and Winchester, where, one day in 1823, William Ellis decided to run holding on to the ball, shows that the Yokohama Foot Ball Club was indeed playing rugby. Moreover, these two examples from newspapers provide the proof to call into question the official story that the game played with an oval ball was first introduced in 1899 to Keio University by Edward Branwell Clarke and his Japanese companion Tanaka Ginnosuke, 25 years after the report of a game in The Graphic, and 33 years after the creation of Yokohama Foot Ball Club. As Mike Galbraith, an expert on the matter who wrote the first history of rugby in Japan in 1987, emphatically points out, all this took place before the two Rugby heroes were even born. Other local press reports support the fact that rugby had been played regularly and that, consequently, the Japanese did not discover the game at the end of the 19th century, but that they were pioneers in its development. Certainly, it was not as successful initially as other sporting activities introduced from abroad around the same time, notably baseball with a game arranged in 1873 at the Kaisei Gakko, which subsequently became Tokyo University. The creation of a professional league in 1934, on the initiative of press baron Shoriki Matsutaro, was a radical game changer for baseball, leading to the appearance of the first stars of sport. Rugby continued to be played in university circles and by teams made up of company workers, and languished, as did football, until it became a professional game at the turn of the 1990s. The example of football and its popular success should challenge those in charge of Japanese rugby in their search for a fresh impetus at a time when the national team – the “Cherry Blossoms” – is starting to achieve good results. The 34 to 32 Japanese victory against the South African team during the 2015 World Cup not only resulted in the admiration of rugby enthusiasts around the world but, above all, re-awoke Japanese pride in their success on the international stage. By becoming a powerful sporting country, as it demonstrated on the occasion of the Football World Cup in Russia earlier this year, Japan is making an impression on worldwide opinion. At this level, rugby is important in as much as it’s still considered to be an elite sport. In addition, it’s a sport whose “values” are well-suited to the Japanese way of thinking. Now, it just remains to put it all into practice. The 2019 World Cup should be the opportunity for Japanese rugby to come into its own and definitively gain the support of the general public at home. The television audiences for the national team are still modest compared with football. After its victory over South Africa in 2015, audiences for the “Cherry Blossoms” were around 19%, whereas they were generally greater for football matches, reaching 55% for the World Cup in Russia. It goes without saying that success when pitted against a great team, as was the case in 2015, is very advantageous. It would allow a new chapter to open in the history of Japanese rugby, which began 150 years ago in the shadow of Mount Fuji, as depicted in the illustration that appeared in The Graphic. So, meet us in Tokyo on 20 September 2019 for the kick-off of the World Cup with a Japan-Russia match that will set the tone for Japanese ambitions, which are definitely sky-high.